"We're not talking about possession, Mrs. Templeton. We're talking about reincarnation." In many respects, reincarnation is meant to be comforting (the idea that one’s soul might recur eternally is more pleasant than the cold reality of death), but, in other respects, it’s sort of bone-chilling. I once spent an entire day at the library poring over books featuring anecdotal evidence of folks with supposed memories of their past lives, plus stories about kids with inexplicable tics, obsessions, and behaviors once shared by recently deceased people. For whatever reason, it’s spooky stuff, and it seems like the filmmakers behind Audrey Rose would agree. Deep down, the film might be the stuff of weepies, but the 70s seemingly dictated that anything involving disturbed children had to be really disturbing, so Audrey Rose is a pretty screwy tale of parents facing unfathomable circumstances, sort of like The Exorcist re-imagined as a New Age melodrama. 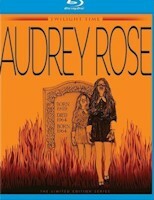 Whereas most of the film’s unsettling elements rumble beneath its surface, it’s first shock is rather outwardly fucked up, as audiences witness a horrific car crash that leaves young Audrey Rose engulfed in flames ,unable to escape from the overturned vehicle. A decade later, the scene shifts to New York, where Janice and Bill Templeton (Marsha Mason and John Beck) live with their daughter, Ivy (Susan Swift). Out of the blue, the family begins to notice a strange man (Anthony Hopkins) stalking them, and he seems particularly concerned about Ivy. Eventually, his cryptic interactions give way to an awkward dinner that ends in his dropping a bombshell: he believes that Ivy is the reincarnation of the daughter that perished that car crash ten years earlier. This revelation plays out in rather sinister fashion; while Audrey Rose is ultimately more of a drama, something sinister guides it towards the familiar trappings of the horror genre. With the intrusion of Hopkins’s character comes the expected beats, as Ivy is prone to inexplicable panic attacks and manages to mysteriously burn herself. The first third of the film plays out like a possession movie, albeit one that’s slightly more metaphysical than most; rather than have Ivy corrupted by demonic forces, she’s tormented by a soul caught in limbo, trying to move on from the purgatory that is Ivy’s body. It’s horrifying in a sad kind of way, especially once it’s clear that the soul of Audrey Rose is fatalistically drawn to destruction and will naturally have to take Ivy with her. From the parents’ perspective, it’s clearly terrifying, particularly for her father, who is convinced his family is being conned by a wacko. Given Hopkins’s persona for the past two decades, his turn here feels retroactively off-putting in a sense, and I suppose his character here is shady enough, especially when he’s bullish enough to abduct Ivy from her apartment during one of her fits; however, his turn here marked by a distinct, haunted sadness, not to mention a firm conviction in his beliefs. The film quickly sympathizes with him in turn, leaving little room for ambiguity or nuance. Once the film confirms his theory to be true, it dismisses most of its horror trimmings, save for a handful of disturbing sequences where Audrey’s soul once again comes into conflict with the vessel it’s so desperate to shed (the sight of Swift obliviously crawling towards a fire is a highlight). Instead, the film shift gears rather dramatically; rather than chronicle the battle for Ivy’s soul, it focuses on the battle for Hopkins’s freedom in court. Shifting to courtroom drama mode only amplifies the melodrama, of course, and the proceedings grow a bit sluggish and even weirdly didactic, as audiences become virtual jury members listening to evidence in this thoroughly bizarre case. The trial seems ridiculous, perhaps even more so because the film has clearly sided with Hopkins already, so the only resulting drama is whether or not this jury will feel likewise. I find it hard to believe they would, and screenwriter Frank De Felitta (adapting from his own novel) perhaps sensed the same thing, which is why the film detours again for the final act, where it indulges some pseudo-scientific practices in order to further explore the possibilities with reincarnation. Imagine The Exorcist with psychologists, with the power of hypnosis subbing for Christ. That it isn’t all completely hokey is a testament to Robert Wise’s helming of the film; by 1977, Wise was among Hollywood’s most seasoned pros, having churned out exceptional work for three decades across multiple genres. His experience is most evident in his treatment of his actors’ performances. Like Friedken before him, Wise opts for restraint—in less capable hands, Audrey Rose would be an overcooked melodrama, but Hopkins and Mason are quite restrained. Swift, too, is noteworthy in her restraint; where most Exorcist rip-offs attempted to enhance to shocks and schlock, Wise opts to strip this story down to its basic human elements by focusing on Ivy’s haunting wails and dead-eyed demeanor. It’s melancholy but tinted by a palpable spookiness, not unlike his Curse of the Cat People, a similarly-themed exploration of preternatural childhood trauma. In a sense, Audrey Rose is Wise coming full circle; while he directed lavish productions throughout his career, both Curse and The Haunting stand as two of his most memorable films. In an era where brooding, atmospheric horror was set to erode in a tidal wave of slashers, Audrey Rose feels like an old master resorting to old tricks that are still rather effective. Things grow a touch too maudlin towards the conclusion, but, for the most part, Audrey Rose is arresting in its treatment of spirituality. Religion offers both horror and comfort here, and it’s an especially exotic brand of what the Western world might consider Middle Eastern mysticism. Both the law and science are conspicuously ineffective, a reflection of the growing fear that the world is indeed guided by malevolent forces, even those that would enable reincarnation. 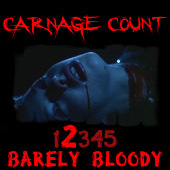 Thanks to Twilight Time, this understated 70s effort is now available on Blu-ray that arrives with a strong transfer (the film’s grain structure is notably left intact), plus an isolated score track (Michael Small’s eerie tones accent the otherwise muted horror quite well) a trailer, and liner notes by Julie Kirgo. It’s an upgrade over the old non-anamorphic DVD, and a well-deserved one at that—Audrey Rose seems to have been overlooked, but hopefully this release will help give it a new lease on life, as it were. Buy it! Audrey Rose and other Twilight Time titles can be purchased at Screen Archives.